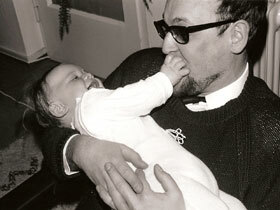 Baby love: Waikato University student Irene Lichtwark pictured as a baby with her father Dr. Wolfgang Mausberg. Waikato University student Irene Lichtwark is researching the role of men and pregnancy for her honours degree but is having trouble finding men wanting to talk about their ‘pregnancy’ experience. Her work is part of a larger Waikato study into pregnancy and stress and Lichtwark says she wants to talk to dads with babies younger than six months to hear about their reactions to pregnancy, their development as fathers and how they feel towards their child. “New mothers find all sorts of opportunities to get together and to talk about what’s going on in their lives, but finding groups of new fathers is proving difficult,” says Lichtwark. She says her questions would take about an hour to get through. Anyone interested in taking part should contact Irene Lichtwark on ircol@slingshot.co.nz.